We could have missed so much if blackout dates when booking a return flight home on points. Of course with that, we would likely be spending New Year’s Eve just with ourselves…and what fun is that? It was a welcome return to Vancouver, starting with a work Christmas party that I had to ask if we were still invited to. On departing for the trip there was no written or handshake agreement that we might be coming back. Even on return, there may have been a little hope a job might still be there for at least me…but in this day and age of company financial woes, anything could happen. To find on return a welcome audience, and Christmas party to let loose at was pleasant. Following that party, another of the surprise variety. Surprise for the guest of honor on arrival that there were so many people gathered in an unexpected venue. Even further surprise to the birthday girl that we were there too. On the Golden Eagle, surprise birthdays happen regularly and it’s the shock on the face of that special someone that really makes those events worthwhile. Glee is the best descriptor, but when glee turns to tears of joy…maybe it’s all a little too much. Each one of those tears is a memory. I just hope I am not the one crying at the next surprise party Melanie throws me. 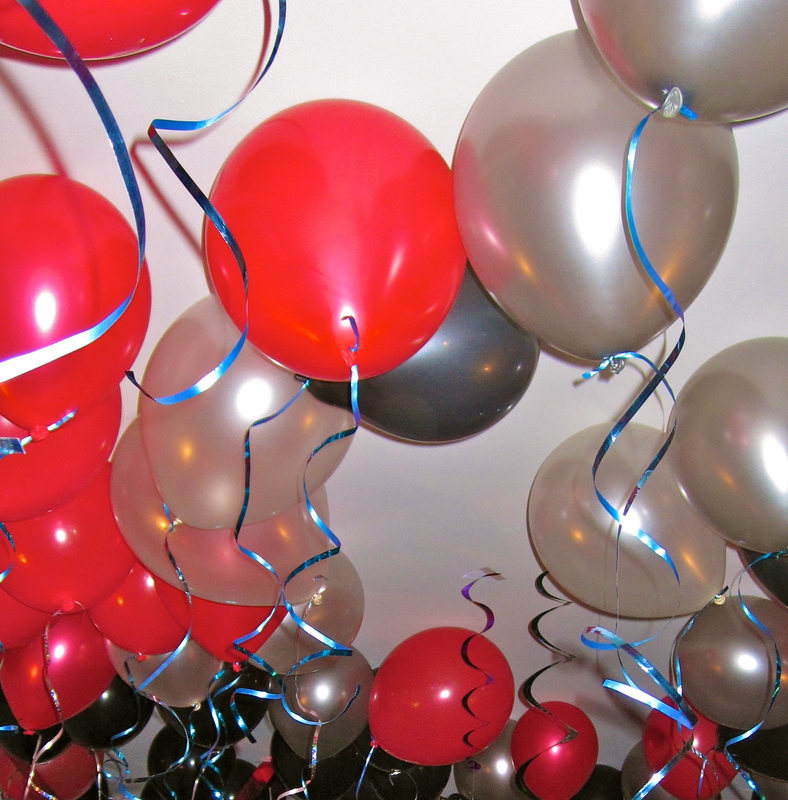 Third party was an eagerly anticipated, much-belated housewarming. Friends galore! Salty snacks, shortbread cookies, drinks all around in a dog-filled house. Stories to share, lives to get caught up on, hugs that required delivery, French choupettes that needed to leave our house in a hurry for fear of consumption by just the two of us. I would post more info, but the pics got a little messy here requiring some serious sequestering. All the fun and games needed a little balance though, and the discover of a university buddy’s floating off of Stanley Park was a bit of a reality check. Here was a guy that was more than an acquaintance, due to our long conversations about girls, studies, worldly direction as well as our own. A guy that would talk your ear off with smooth big words begging the need of a dictionary for those of us laypeople, and follow that up with a raging performance in the ball hockey court with a few major penalties. A university relationship that like most…ends after graduation. Seeing the article that he was missing, then found, really makes me wonder how many more of those passing relationships should be maintained…and if forgotten, should be revived? It wasn’t until the memorial that Kevin and I found out that this guy had gone off to Spain for a few years, learned to be fluent in Spanish, then married a Korean gal. More importantly, two little boys…with the oldest being 8. It only seemed like a couple years ago since I last saw Simon, but what seems like a relatively short time turned out to be 10 or 12 years. Lesson learned… make the effort to stay in touch. So after that downing experience, I was all prepared to write an article about the experience of ferry travel. Previous trips have been loaded with virus-laden passengers all hacking and sneezing over every public surface. Rain-snow mixtures falling from the sky usually make the roads slippery, including the approach to the ferry resulting in late departures. Masses of people making the pricey trek lined up for hours hoping that they’ll make it onto the next boat. Surprisingly…we had none of these experiences. Ferries left a few minutes early, and half full. Weather was clear, maybe a little drizzle as is typical of Vancouver, and I had the great company of Melanie. That article half prepared will likely now sit in my Draft bin for another year in hopes of finding those undesirable ferry experiences to write about and finish it off. 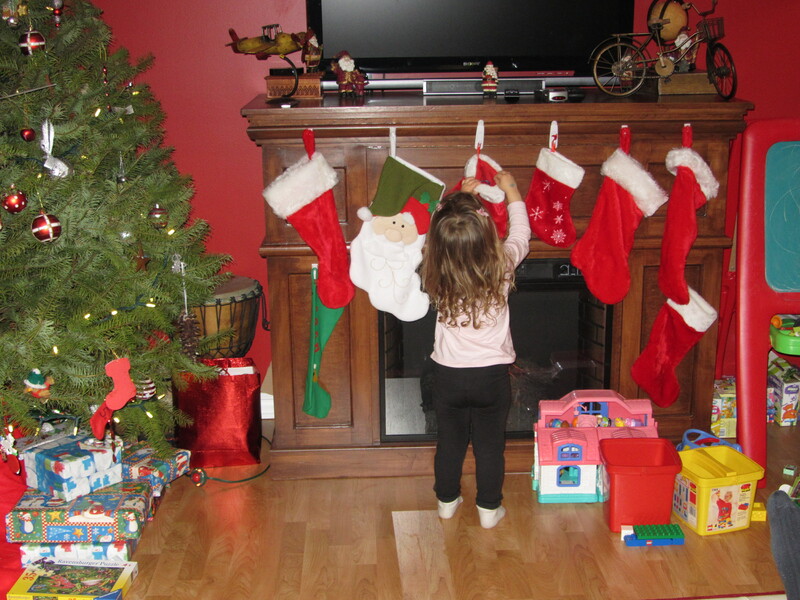 What could she possibly be putting into those stockings? And Christmas, well there’s no need to complain about tasty food, piles of sweets, and good company. Gifts handed over that were a combination of both Christmas and souvenir. French finger puppets that were well received by a niece of almost three years old. Caramels, aprons, wallets, Murano glassware all in exchange for candles, beer, and a bag of various chocolates big enough to treat a small army. So many that we have had to store them in the back of my car…parked on the street to mitigate the compulsion to consume the entire lot in a single evening. The only time we might ever need chocolate, and I am referring to the both of us…is if we’re desperate for a sugar fix due to a whole day of hiking around. That doesn’t happen often enough when back here, which is why we’re looking for a third party to secure the sweets and dispense them to us in a regular fashion throughout the year…only if we’ve been good of course. 3D camera? My finger and full belly are not to be accentuated with technology! Second Christmas…much the same as the first but with more gut-filling eats, this time to the point of hurt. Maybe it’s the lack of complete digestion of the first meal, maybe it was the bean dip that preceded the meal. Regardless, breakfast the next morning was not required…but a coffee filled with Carolans was found to be a great start to the day. In fact, the three working days this week were much easier to get through with one of these coffees mixed up at the perky hour of 7am. Might have to replace our usual cream option with this boozy alternative. Now we’re prepping for a night out of New Year’s festivities. A few friends, a few drinks, a few free bus rides to get us around from venue to venue. As for getting home…that might just be walking. After all those months of walking for hours and hours each day, maybe tonight will be another of those long, cold aimless strolls…just in direction of our home and warm comfy bed. Happy New Year to all. Although 2012 is rumored to be the last, it still isn’t likely to be just that. Let’s live it up as if it were though by not taking life too seriously, live every day as if it really were your last, and reconnect with those people that may be forgotten, but not lost. This entry was posted in Vancouver and tagged salty snacks, surprise birthday, work christmas party on December 31, 2011 by cstoner. Ah WordPress.com… It seems as if they want me to feel good about the little traffic I have received for the whole year, even though it’s only been a few months of writing. Below they have compiled pics, stats, and some generalized 2011 annual report which I will not take any credit for. Thanks to the regular readers, commenters, and ‘Likers’. The rest of your are almost dead to me. This entry was posted in Vancouver on December 31, 2011 by cstoner. Well we’ve been back 7 days. No I am not about to start a blog about resumption of our daily happenings here in Vancouver, but I do need to do a little writing of some sort. Besides, blog traffic has dropped to only visitors stumbling upon the site while searching for puffy coats or belly button lint. The audience may have dried up a little, but that doesn’t mean the writing has to…does it? It’s already been a week since seeing this sun and surf. Maybe we can find a cocktail with that blue, and dream our way back. I know not everyone has stayed abreast of the 75+ posts. Competing with Jersey Shore or news of a hockey trade for all of 3 minutes isn’t even a contest. It appears a few posts seem to have left a lasting impression on people, such as the breakfast choices post from a couple weeks ago. Whether this was a moment of unique observation that magically combined with what I could muster for writing skills that day, or the post just became a highlighted story on your Facebook newsfeed is yet to be determined. I heard that one guy actually read the post to his 5 year old daughter as a bit of a bedtime story, of course obscenities carefully edited in his verbal portrayal of that electronic word. Regardless, if anyone wants to get into this site and review the plethora of material…word of warning, it may take a while. Grab a beer, or coffee and sit back with mouse in hand. As for us, settling back into a life of reality is slowly underway. The jetlag has worn off resulting in near regular sleeping patterns. The skin is drying out, and not sure why because it’s raining out there in this typical 4 degree Vancouver winter weather. The car has been dug out from the leaves piled around it, and surprisingly no mushrooms growing in the damp carpet under the seats. Unpaid bills that sat in the mailbox for two months have been brought up to date, and account holds removed to permit further spending. A full fridge of groceries is now in place, meaning no more drinking of milk from tetra-paks and a return to brewing up a pot of ground coffee instead of the freeze-dried instant we became so accustomed to. Time to break out the paintbrush. 4 years of beige is enough. Ah yes… my first sip of gin in 3 months. Certainly there were bottles of this clear juniper-flavoured moonshine available in most jurisdictions we stayed, but not once were we intent on going out and getting smashed. We’re all grown up though, and drinking until we can’t stand up is less entertaining now than it might have been 15-20 years ago. Of course there are still a few Christmas get-togethers and I am sure a little hot wine will need to be sought out…for comparative research purposes of course. Before heading out into the cold rainy evenings here in search of a Christmas market or warm pub to meet up with friends, we’ll need to readjust to our surroundings here. With one week stints in each domicile while away we adjusted to splashes of color on walls, poor furnishings and cigarette smoke sucked through the walls. Dirty sheets, or a leftover bread heel in the fridge were to be expected with each new accommodation. With our own place, it was comforting to find we only had a few unsprouted potatoes, some prunes and a half tin of coffee left in the fridge. It was also obvious that we also desperately need to put a little color on the walls as the neutral warm tones of a beige, technically ‘muslin’, just don’t evoke the same pop as a vibrant limoncello yellow or the burgundies of a wine red. Not to worry, Melanie is on it and will be diverting the energy usually put into walking for hours each day, to adjusting any blandness in our previous choice in wall color. She’ll be slaving on that painting activity while inhaling the mystery cooking odours arising from the neighbouring ethnic cuisines. Maybe a little accordion music from through some internet radio station to set the mood and the transition back to life at home can be slow and steady. Add to it that spinach and chicken frozen pizza kept on the bottom shelf of the freezer, only to be thawed in the event of emergency, and it’s almost like she never left. I’ll just be at work. This entry was posted in Vancouver and tagged December in Vancouver, vacation is over, Vancouver, winter on December 15, 2011 by cstoner. We’re flying out today. After 71 days away from home, we need a bit of a break from this vacationing thing. We’ve effectively been gone for 20% of the year, so it’s time to water the plants and check the mail. How does one do such a trip? You may ask…how can I do that? How much planning is involved for such an epic journey? All good questions…and the first thing is to not have a plan. It was circumstance that seemed to lead us into this whirlwind journey. Years of promising each other that when the time was right, we would look at going away for a month. Life seems to just get in the way though with work commitments, family, business, kids…we just had to set the few things we had aside and go for it. There were no kids involved if anyone that doesn’t know us was wondering. As for the planning, we had about 4 weeks notice. More planning likely could have been done if we had aimed to accomplish such a venture as part of a resolution or bucket-list item, but no…give us a few weeks and internet along the way to figure things out, and we’ll book that return ticket when we’re ready…or out of money. Accommodation. We stayed in 12 different cities & towns over that 71 day span, ranging in size from not on the map (Pogerola) to Paris. Visited another 11 towns on day trips, seeing over-hyped castles and medieval villages. We likely could have done more…but damn it’s tiring being on the go every day. We rented 8 different apartments, and only had to bail on one of them. 5 different hotels over that span, nothing worse than an Italian 3-star…nothing better than an Italian 4-star (really there doesn’t seem to be any difference, other than maybe the number of panes of glass in the windows). Not once did we get caught having to resort to overnight train sleeping, or getting stuck in a bus station in the wee hours of the morning. This was the back way into Amalfi. Not for the faint of heart. 24 train trips, involving 27 different trains. Only 2 planes thus far. With another 2 for the trip home. If I had only thought ahead, I could have burned up a few more of those credit card travel points on travelling in style…first class. If you’re looking for us, I think those booking on points are likely positioned next to the most commonly used toilets, in the seats with no legroom and a broken entertainment unit. Only about a dozen buses. When in Pogerola, other than walking the 1000 steps into town, the only other way was via bus…and these were almost daily. Plus the number of connections was uncountable. The Cannes to Nice run was by far the most terrible of all for duration, making up for the lack of quantity. Oh yeah, one more bus to the airport. No taxi for this budget twosome. Dinner in house…well the last two weeks of the trip almost religiously. Before that…almost every night out with the goal to eat at a different restaurant each time. We did well up until Florence…then just gave in to familiarity. Pizza and pasta is pretty much the same from restaurant to restaurant, and when ordering a half litre of wine every night we were beginning to wonder if we needed the wine to enjoy each other’s company. Of course we didn’t…it’s our 11th anniversary today, and we’re celebrating with a plane trip home. In the past we skimped and called the company Christmas party our anniversary, this year British Airways is picking up the dinner and drinks. 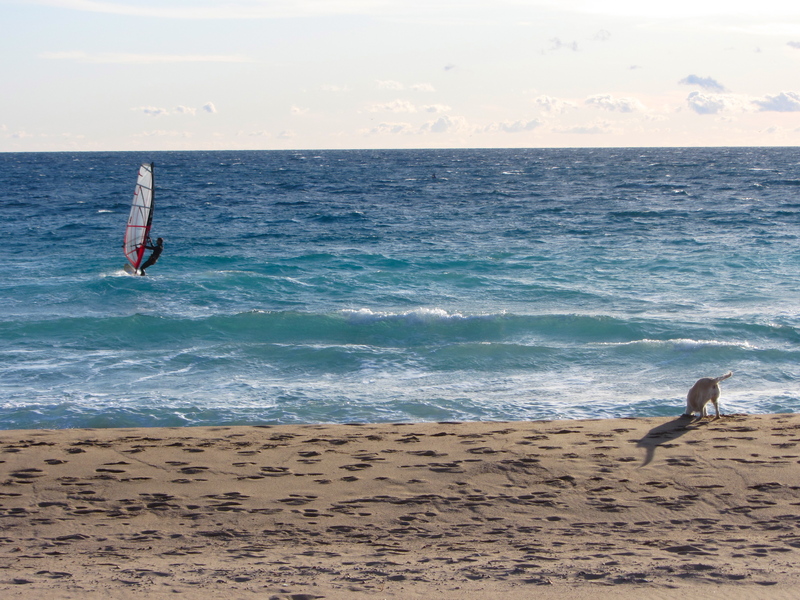 Cannes has the sandy beaches…and wind…unbelievable wind! And with this goal of creating a blog a day of more than 500 words, well it appears to be close to achieved. This makes 76 published posts, a few of those being all pictures, and aarly posts are a little weak on words and format. Still 4 posts sitting in the ‘draft’ state, with one behemoth on the ‘history of the pizza cutter’ that will likely never see the light of day due to exhaustive research to ensure the facts discussed are in fact accurate. Of course this is the internet and fact seems to be less frequent than opinion. The ‘post-a-day’ goal wasn’t set until a week or two in when it appeared I might be able to do it. To accomplish such a feat, a dedicated machine was required…both portable and fun to use. We went with an 11inch Macbook Air, and find now that an external hard drive might also be required for the 50GB of photos we have this thing now loaded up with. If you don’t have the tools to enable you, then however are you supposed to come up with the motivation? It now seems we each need one of these machines to maintain peace in the household. Melanie to work on her pictures, and me to continue writing to appeal to new blog followers in the US, India and Russia. And how much has this whole escapade cost? We’ll save that conversation for over a beer or two. We did have a target in mind to keep accommodation to less than $100CDN per day…and we did that with margin to spare. Transportation costs averaged out to less than $50 per day…but could have been less without paying cancellation fees for changed train and flights. Food and entertainment spend…we had a hard cap of $100 per day on that and fell well below that once we started cooking for ourselves. We’ll say less than a new compact car, more than a large jar of Nutella. In the end, the dollar amount is irrelevant as this really is an experience that could have been saved for retirement. Instead we’re spending those retirement dollars now, and why not? What could possibly be next as a follow up to this trip? If I knew, I might be able to offer up some hints. Very little planning involved with this trip. I can’t say the timing worked out either, or that the funds were there burning a hole in our pockets. Maybe Australia. I also wouldn’t mind renting a van and driving through North America though. 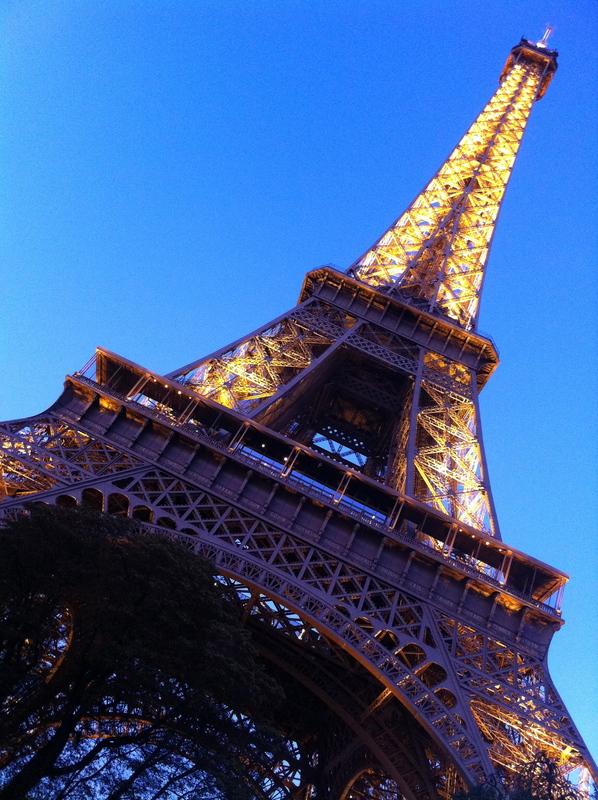 This entry was posted in France 2011 and tagged extended vacation, nice, Paris, Prague, vacation, Vacation Rental on December 9, 2011 by cstoner. Maybe a set of house numbers? 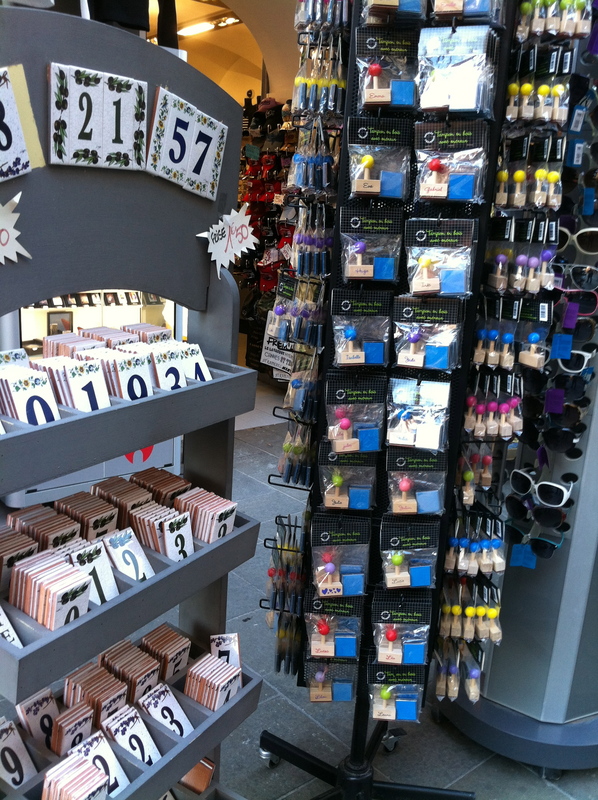 A personalized rubber stamp? With our trip wrapping up, it’s time for the acquisition of a few souvenirs. Gifts and souvenirs always stress me out, only because the variety of items offered are usually generic and impersonal making them destined for the dustbin shortly after handover. Certainly this isn’t the case for all souvenirs. The options for women seem to be endless, with necklaces, pendants, rings of every imaginable shape, size and color. Soaps, chocolates, porcelain plates with some hand painted characters. For a guy though, the options seem to be a bit more limited. Even with Christmas coming up, the simple solution for a gift is to get a voucher to Home Depot and go buy some tools. Men like tools, not fridge magnets. Restrictions on souvenirs are certainly limited to what a guy might like, but more importantly small and light, non-perishable, and something that will arrive intact. 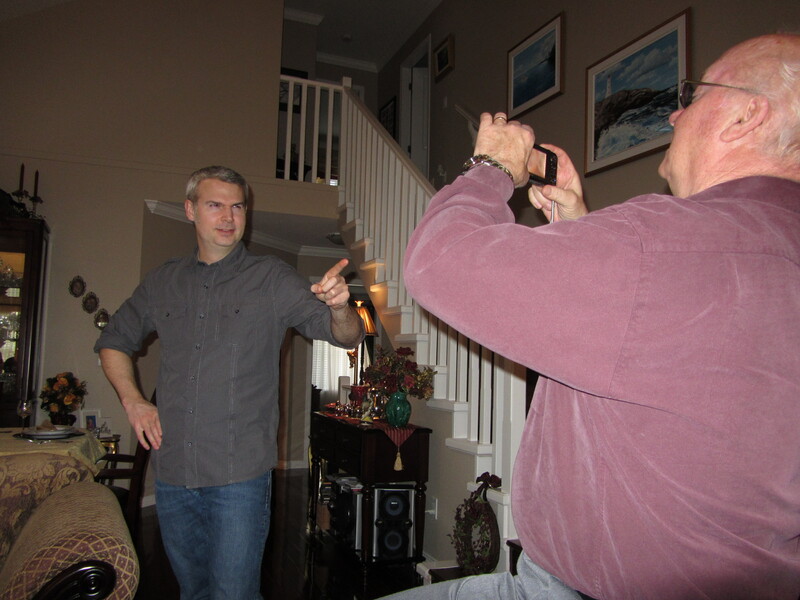 What might Dad like, or that brother-in-law? Below is a short breakdown on a few of the male-oriented items we’ve encountered and struggled with the possibility of purchase. For the guys you’re thinking specifically of, one of these suggestions may be spot on. Aprons? Likely a little suggestive, unless spending a lot of time in the kitchen already. Maybe best suited for a guy that already has several aprons, and not the kind worn in the woodshop. Rolling pins, spatulas and wooden spoons could also fall into this category. They are all beautifully carved and finished pieces…but souvenir worthy? If the budget allows for a fancy Zippo knock-off, this might work. Does he smoke though? Pens? Possibly for that guy that writes a number of letters. Maybe someone that carries a couple pens around for show, or is afraid of contacting the communal pens at banks and shopping markets when signing that credit card slip (yes, they don’t use the PIN everywhere). Make sure the pen is marked with the souvenir city of purchase, and at least one of those bikinis that slip off when the pen is inverted. Watches? A watch is a watch, and can be purchased pretty much anywhere. Unless it’s duty-free, or a deeply discounted knock-off, why load up your luggage with a timepiece with limited warranty. The belt buckle. For a Texan, Albertan, or other farming territory requiring heeled boots and oversized waist-mounted jewelry. We’ve seen some wicked belts, but a belt is a belt. Not too many guys are showing off their belts, or discussing waist side with anyone potentially looking to buy souvenirs. Ah, the wooden games and puzzles. We’ve run across chinese checkers, and even regular checkers, all nicely carved into a set that rivals the price of a small car. Small chess sets seem to be typical souvenir items as well, however these are usually sets that sit in a box somewhere in the crawl space, or are set up in the corner of the room for display…slowly collecting dust. How about a corkscrew with the city of vacation written across the handle? Corkscrews are handy on occasion, but if there’s very little wine drinking in the house that corkscrew might be used as a wall anchor to create a temporary coat hook. Of course there are the old standards of the bottle opener, keychain, and combination of the two that could possibly be retained as a gift. Maybe used for that spare set of keys handed over to the neighbour. T-shirts? The only t-shirt option seems to be the “I heart someplace”. As a souvenir, this only seems to work for the person buying the shirt. How could anyone you hand the shirt off to say they love a place if they haven’t been there. The good thing about being in Nice, is the shirts imply “I love nice!”, which would be near equivalent to “I love happy, spaceships, or cuddly teddy bears”, just in poorer english. Still not likely suitable for most guys as the big red heart on the shirt just isn’t studly enough. The default seems to be consumable items. Maybe a vacuum packed cured meat or cheese. Something that will likely be consumed in 5 minutes and forgotten about in a week or two unless the smell still lingers in the fridge or unemptied wastebasket. Candies, chocolates, cookies…aim for something unique that could be washed down with a coffee or beer. What would I want? The reality is I wouldn’t want anything. Buy me a beer when we meet up again and we can chat. Simple, easy, no need to go out of your way to try and bring something kitschy back. Just good to know you at least considered me in your struggles with shopping. This entry was posted in France 2011, Italy 2011 and tagged buying for men, gifts for men, souvenirs, souvenirs for men, vacation, vacation souvenirs on December 8, 2011 by cstoner. Train or Bus from Nice to Cannes? Train! Maybe we should have taken the train back. The ride out this way wasn’t bad. 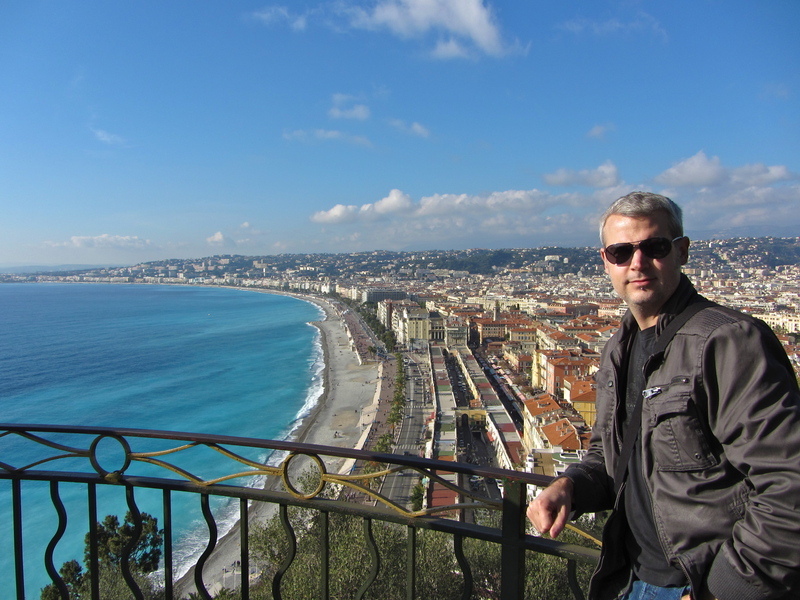 We tried a day trip from Nice to nearby Antibes and Cannes. Seemed easy enough with the bus terminal nearby and only a one euro fare per person. Can’t get much simpler. A couple nights ago we decided to scout out the bus station. My phone maps suggested we were close…and sure enough that construction site full of dozers and dump trucks is right where Gare Routiere should be. The buses still run, but from where? A little research revealed that in January 2011 they started reconstruction on the site… not of a new central bus station but of a park. Ok…more green space in a city already full of plazas and palm trees? Where do the buses go? The answer for transit organizers was to spread out the pickup points for Nice buses over a ten block radius. How do you find your bus? If you are lucky you might stumble across a shelter with a map outlining pickup points. Luckier still, you might be at that pickup point without knowing it. It only took us twenty minutes, along with some helpful locals to find where the 200 to Cannes leaves from. Another option, if you aren’t hurried for time, is to stalk your bus. Watch where it stops and walk up that way waiting for the next one in 15-20 minutes. Just enough time to enjoy a warmed quiche…although an American guy in Paris once told us that “real men don’t eat quiche”. Maybe he was more into the raw egg protein powder shake. Look closely at the guy in the cap and you may see stink lines radiating from him. The bus to Antibes, not bad. Scenic, warm, sunny, quiet…smelly. To ensure the sensory experience was complete, it wasn’t the faint traces of salt in the sea air that had our noses lit up. It was of course the fellow passengers on the bus taking advantage of the cheap transport to move them down the coast. I have noted excessive cheap perfume as an offense worthy of some fine or punishment in previous blogs, but here I was almost praying for some young gal to enter the bus and grace us with her lack of olfactory self awareness. It was just one guy that had an odor challenging that of your friendly cattle barn or pig farm. For you city dwellers, imagine that one guy at the gym with odiferous pores, mix that with a pee-soaked alley, and add a pinch of shopping cart…or recycling depot. The two guys with the second most odorous garments were even noting the rankness of this individual…which really has to be a signal. The joys of public transit. But it’s the cheap fare and great opportunity to meet different people that you ride the bus…right? After a 90-minute pit stop in Antibes to grab a sandwich and stroll around the old town we grabbed the next bus to Cannes. Lesson learned from the previous ride was to choose only seats near the front of the bus…anywhere! Cannes was a nice little spot for a break. Windy as hell, but sunny and still warm. Two hours of wandering the beaches, checking out the castle for a few pics, and stopping to look at the local circus attractions was enough for us. A 16:00 departure for the bus would put us back in around 17:30, just in time to grab a bite to eat and start in again on blog writing and picture editing. 20 minutes into the ride and it was fairly evident we weren’t going to make that time target without some shortcuts, and a city bus doesn’t make shortcuts. It was rush hour, and in this part of the world there seems to be about two roads that run along the coast to connect the numerous pretty little towns, a highway and a milk run. Almost one hour late getting back, hungry, thirsty and in need of a toilet. Destination started out as 200 Nice. 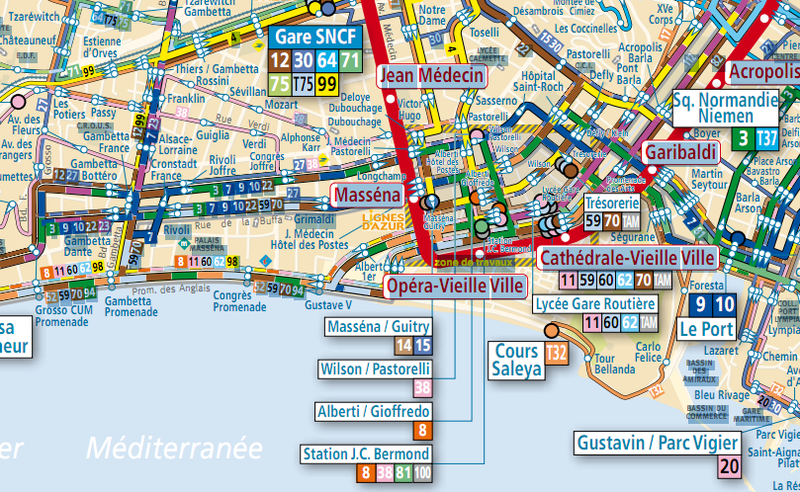 The milk run had it’s usual stop at the Cannes train station to pick up even more people on an already crowded bus. This group that got on though ended up being ticket inspectors. No problem, just have to rifle through the slips of paper in my pocket to find the right receipt and we’re good. One pocket…two receipts from the previous two legs, a couple unstamped tram passes, some tissues and an old train ticket…just a second. Next pocket…empty. Third, fourth and fifth…also empty. Accusations from my travelling partner that I carry around too much excess paper were not helping the matter at the moment. A second inspector starts walking over, bus stopped the whole time with every passenger now training their eyes on us two foreigners not abiding by the rules, then Voila! Melanie had it all along just in her coat pocket. It was 90 minutes in, and we could see where we had to go. That ferris wheel was noted in the distance across the bay, but with three more little seaside communities to navigate in a bus just big enough meant we were in for a long go of it. No bathrooms on these buses. no food or drink allowed. We were already so dehydrated and beaten down from the ride, we could have been easily mistaken for locals. We did finally arrive 18:30 making it an exhausting 2:30 from Cannes to Nice. Tip: Avoid long local bus trips around rush hour! In case you’re wondering, it’s a 30euro fine for no valid bus ticket, double that up and we would be up to 60euro. What I wonder is if that’s payable on the spot or your get hauled off to some French transit prison, or if they just handcuff you to the bus as punishment? I might pick the former. 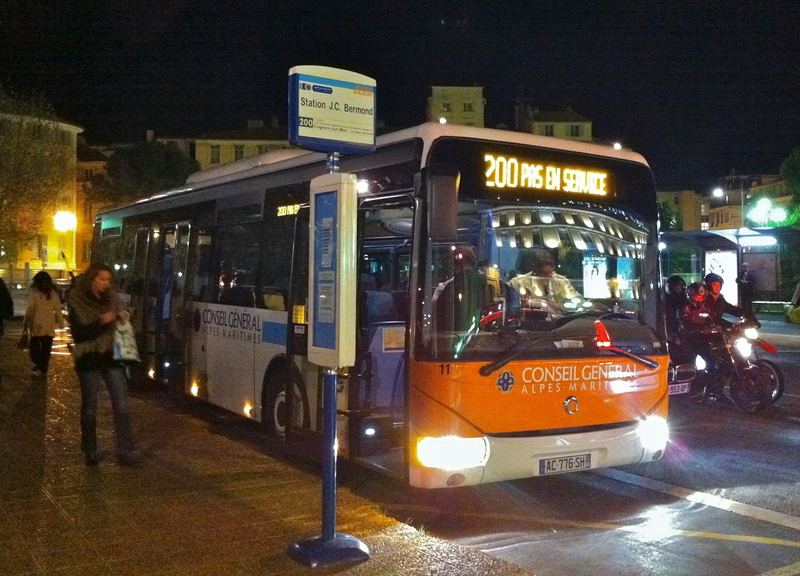 This entry was posted in France 2011 and tagged bus to cannes, cannes, cote d'azur, gare routiere, nice, travel, vacation on December 7, 2011 by cstoner. A little windy…and where’s the sand? Nice is nice. How many times have you heard that? Even when searching Google Images, or things to do, “Nice” is a very hard search term to get any positive results from. Add ‘France’ and it gets you a little closer. Nice really is a great stop along the coast. Neat old town, efficient tram system to move people throughout the city. A population that doesn’t dominate the entire vista. It’s not a small town, but similar to Florence in what I would like to call the ‘just right’ category. Two issues that could be worked on though would be sanding the beach to replace some of those ankle-twisting rocks that line the coast and more dog poo collection, or city crackdown of some sort. I am not the only one occasionally stepping in the brown stuff. 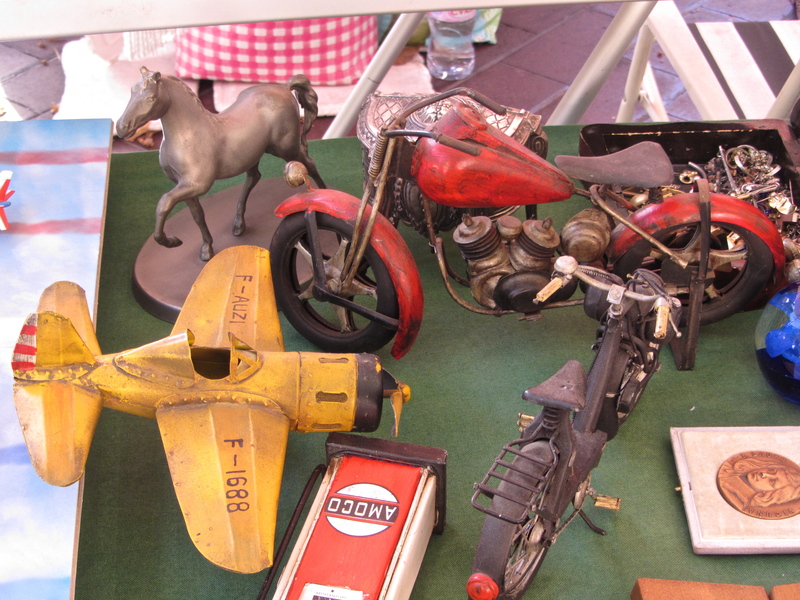 One of the surprising finds yesterday was a weekly antiques market down on Cours Saleya. We walked by this street the day before and it was nothing but patio dining. Another walk by, on a Monday, and the street was filled with what must have been close to 200 vendors all with goods for sale. Broken pocket watches and lighters from many eras past. Boxes of postcards, timeworn, stamped, and at one point before email they alerted family and loved ones of travels. Model cars, lamps and silverware. Books and screened posters. Personal letters and corporate documents all in plastic sleeves. Boxes filled with French francs, all being sold for one euro…which I found interesting because back in ’98 the exchange was locked at just under 7 francs to the euro. Did these coins appreciate in value due to discontinuation? Oh, I can’t forget the 1900’s coffee tables, radios and phonographs. Oh how much fun we could have decorating a place with the goods here. For those of you looking for a rough video walkthrough of the Nice Antiques Market, with english commentary, see the link. Another day requiring sunscreen. Definitely not used to this as at this time of year, we’re used to the grey cold, fireplaces, and the unending chorus of carols. Here, the effort put into turning a seasonably warm location into something more typical of the season shown on television is surprising. Bring in the Christmas trees. Spray them down with some white fluff, that might normally be used to reinforce the loose gravel next to a roadway. Add disco balls, a ferris wheel, and zamboni groomed temporary ice rink…and voila! You’ve got a Christmas market. 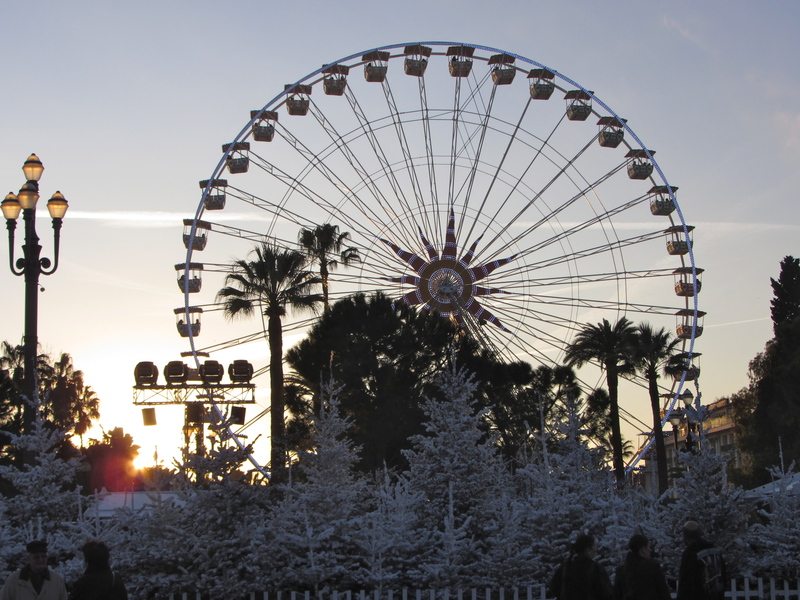 Palm trees, fake snow and a ferris wheel. That sounds like winter, kinda. The ferris wheel amazes me. It definitely wasn’t here last year in October. It’s an object that takes significant effort to assemble and operate. It is a great focal point, and draws people in from all over the city as a beacon, and hey…we went for a ride. In addition to the ferris wheel, we’ve seen your standard carousel and a netted-in area that parents were hauling their kids into. From the top of the ferris wheel you can see that this area is simply an array of trampolines where kids are left for half an hour to burn off a little of that excess sugar ingested from the cotton candy and mini-churros served with a side of Nutella. Mmmm…Nutella. Is there anything that couldn’t use an extra dollop of the sweet stuff? Even cut with a little dark chocolate, it’s damn tasty. For four weeks the city is putting on Noël à Nice, and based on Youtube hits during a search for the link, it appears to be happening annually. Live music in the plazas, with only one small collection of out-of-tune carollers amplified in the corner. One Santa making balloon animals both day and night. Hot wine served alongside waffles dusted in icing sugar or marmalade. More chachkas to be best used as stocking stuffers. 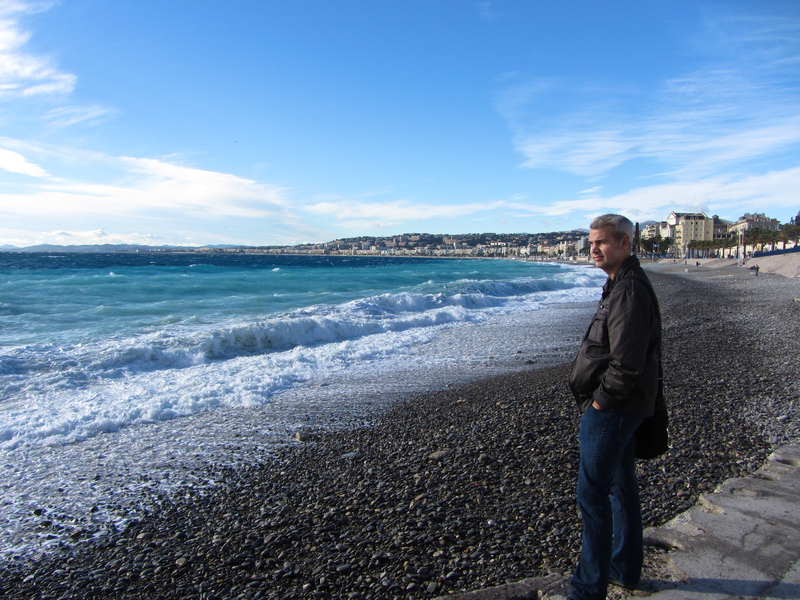 If you happen to consider an off-season trip to the south of France…definitely swing by Nice. This entry was posted in France 2011 and tagged Christmas Market, cours saleya, ferris wheel, Nice antiques market, Nice france, nice old town, vacation on December 6, 2011 by cstoner.